So after my dilemma of whether to upgrade or replace my bike, I went for upgrading the drivetrain to start with. I originally built my Kona with 27 speed Deore LX, which at the time was a brand new groupset. SLX is the direct modern equivalent, so I bought a 2 x 10 setup from Merlin Cycles. I actually bought a full groupset and sold the brakes on – this got me the 2 x 10 drivetrain, at a great price – all in I paid £229 for it. What did I get for that? I got a 2 ring chainset with 38 & 26 teeth rings and integrated bottom bracket, pair of 10 speed rapidfire shifters, front and rear derailleurs, chain and 11-34 cassette. 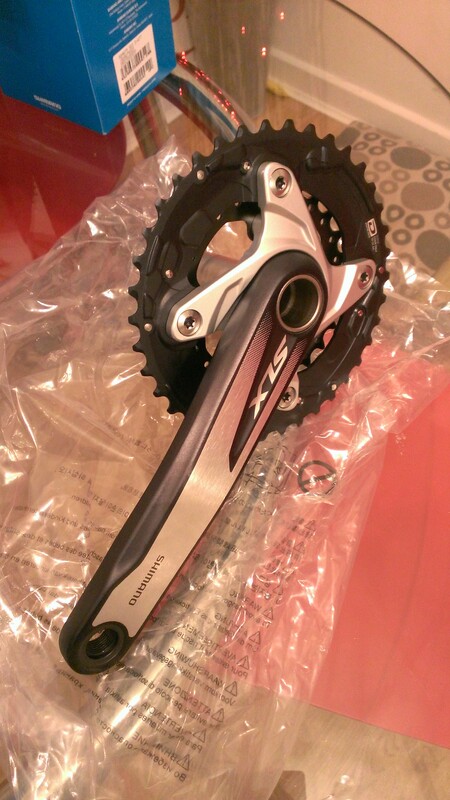 The chainset is beautiful – I know I used to be an engineer, but it’s wonderfully machined and finished. It’s also light at 759g including the integrated bottom bracket. The old LX felt quite clunky by comparison. 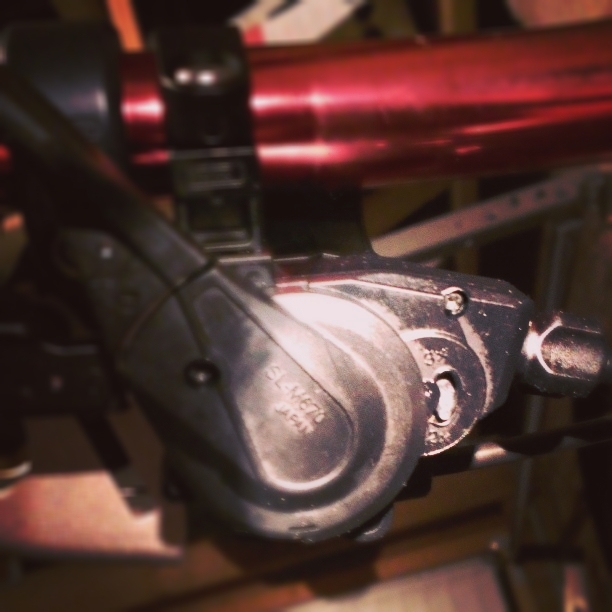 The front derailleur is a dual mode one so it works with cable pulling from either direction and I was pleased to find it came with adaptors that fitted in my skinny steel seat tube. The rear derailleur is the long cage shadow plus model, with the clutch to reduce chain slap. This is a first for me and means I can finally retire the DCD (Dave’s Chain Device) that I’ve had on the Kona since I built it! There was a choice of cassette, ranging from 32-36 on the largest sprocket, but I opted for the 34 as being plenty for my needs. I actually compared all the ratios from old and new setups (I’m a bit sad that way! ), but the important numbers with the max and min gearings. So on the old setup, adding the wheel size into the maths, 1 rotation would drive you forward 95″ on the largest gear, and 20″ for the smallest. The new setup gives me 90″ for the largest gear and 20″ on the lowest – so same lowest gear, but a slightly reduced highest. I think that will be fine for me, as I do mainly cross country and stay on bumpy stuff as much as possible, but I know if I swap the 38t for a 40t, I would get the 95″ max back should I want it. The final parts are the shifters. I must confess these are a big part of my love for Shimano, and I much prefer them over SRAM’s equivalent. I prefer to shift down pressing a button toward myself with my finger, rather than another thumb push away from me like SRAM do. However I do really like that shimano give you a choice – you can do either, and at any time as well. I did get caught out with one aspect fitting the front shifter though. After fitting and during setup I noticed the front shifter was acting as though there were 3 rings, not 2. Not a massive issue once the front derailleur was adjusted properly, but annoying and I wondered if I had been sent the wrong part. So after a quick Google search I discovered they are switchable and just happened to be in 3 ring mode. Apparently all it took to convert was the flick of a lever. But, and its a big but, no-one mentioned where this lever was!! Seriously, I spent ages searching the part and online for advice – everyone mentioned the lever, but didn’t say where it was!! Finally I found it – a tiny grey button that you flick from 3 to 2. So here’s a picture so you don’t suffer like I did! Once activated, it’s all works perfectly – I didn’t even need to adjust the setup. Once all fitted and setup – which was quick and easy to do – it was time for a test ride. As usual I tried everything out at the Croft Trail, which has the advantage of never being too far to walk back to the big tool kit in the car if something goes wrong! I’m happy to say that wasn’t necessary though and it all worked flawlessly. Shifting performance is excellent, being quick, smooth and dependable, even under heavy load climbing out of corners. This was true for the front as well as rear, and front shifting has definitely improved a lot since the LX days. It was even more impressive as the gap between rings is now larger as well. The clutch in the shadow mech works really too. There is a tiny bit of chain slap in high gears, but I’ve deliberately kept the chain on the long side for now while I decide if I want a 40t front cog. However given the chain is running at the full 116 links I’m impressed with how little chain slap there is. It did take a while to adjust from 3×9 to 2×10. Clearly I used to shift between rings, rather than on the cassette, more than I remember, but I soon found the right gears for use round Croft. The range has been fine so far as well, but I have a longer ride at the weekend which will put that slightly lower top gear to the test. Round the trail it was just fine though. 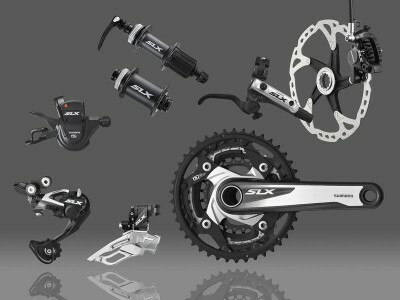 Overall I’m very impressed and happy with SLX. The shifting is excellent and dependable, it was easy to fit and the bike has lost some weight too. And all for a pretty bargain price – highly recommended.